My loves, in the left corner you will find Badgley Mischka’s mesmerizing Kiss Kiss Slingback Glitter Pumps in Gold; in the right corner allow your ravishing peepers to rove over rsvp’s darling Daxton in Gold. Though the Mischka marvels sport an ever so slight higher heel (4 ½ inches as opposed to the 4 5/8 inches of the Daxton); for a mere $59.00, in comparison to the $199.99 needed to dance the night away in the Kiss Kiss, they are le perfect compromise for the frugal fashionista – and allow one to scoop up all three sassy shades (Gold, Black, and Silver)! Thanks to Heels and Zappos for the pictures. great find, rsvp it is!! Ahhhhh the kiss kiss slingback glitter pumps are gorgeous!! Love them both but I am going thrifty on this one.... Beautiful shoe, every time I see a shoe like this I think of Cinderella. I would love to have the Badgley Mishka pumps. They're more sparkly. Gorgeous neutral pumps? Love it! 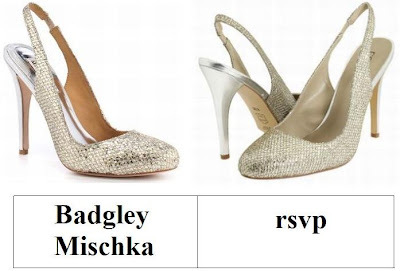 I'd definitely go with RSVP, but I wish the heel were a bit shorter. I love sparkles and I love heels, so these are perfect. Definitley loving the RSVP pair. I'll go for the RSVPs -- so cute! I'm with Natasha, I want them both! What a match! I think I'd be ok with the RSVP's, actually. Pretty! I purchased a similar pair of Nine West heels from TJ Maxx for $35 a few months ago. I am currently going through a phase where I love sling backs. I would buy these in a heartbeat if I wasn't on a very strict wedding planning budget. Can I have these? Please? I would love the person forever who got these for me. yes for the B.M. ones- I love!!!! Great shoes! You always find the best shoes! i was expecting the Kiss Kiss pumps to be more expensive...love the glitter! oh my! both are gorgeous. I wouldn't mind traipsing around town in either slippers!